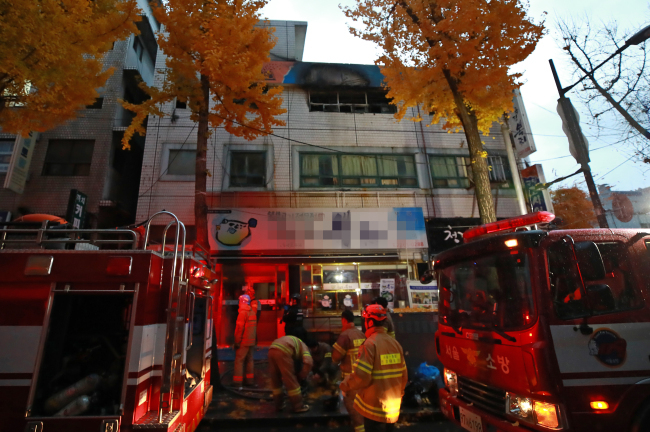 A fire broke out early morning Friday at a low-cost dormitory-style housing facility in Jongno-gu, Seoul, leaving at least six dead and 12 injured, the local fire department said. The fire started on the third floor of the three-story building at around 5 a.m. and was fully extinguished by 7 a.m., according to firefighters. Investigation into the exact cause of the fire is still in progress, but authorities believe that the fire started at the third floor entrance, trapping the residents on the floor. No sprinkler system was found at the scene. Fifty people, many of them daytime laborers, were living at the gosiwon on the second and third floors of the building. Many of the injured were in their 40 to 60s. Authorities said the number of casualties could continue to rise.